Welcome! Thanks for taking time to hop on over to my blog. I'm glad you found your way, I'm the last stop on this blog hop. If you missed someone here is the order so you can get back on track! Everyone knows that I have a bit of a problem when it comes to shopping especially when shopping for scrapbook supplies. 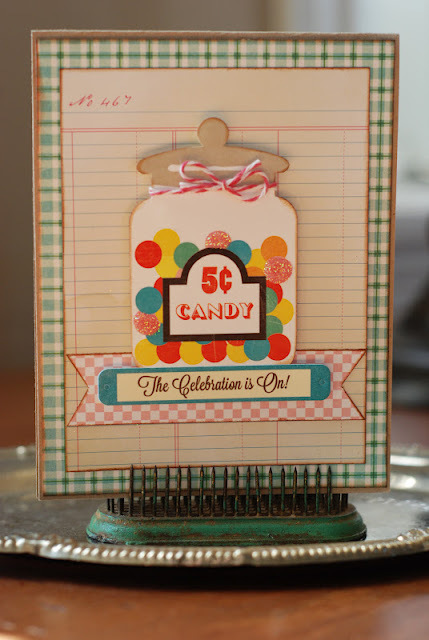 One of my very favorite places to shop is ScrapbookSteals.com. They have TWO steals a day (9am and 9pm Mst). I religiously visit this site at least twice a day (sometimes more). For the projects that I have to share today I got to use the Martha Stewart glitter. I admit that I'm a girly girl and I love things that sparkle. So creating with glitter was like a big party for me. My house is still sparkling from it. After I covered the circles in paper I used spray adhesive and then applied the glitter. 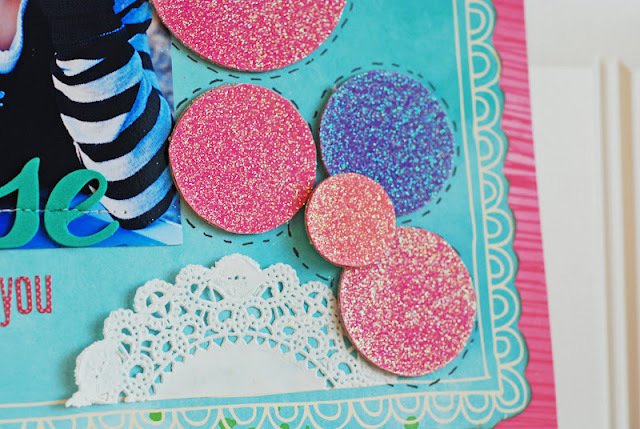 I then used the glittered circles as the main embellishment on my page. The next project I have to share is a set of cards. I used the glitter and some glossy accents to dress up some stickers. I just highlighted some of the sticker with glossy accents and sprinkled the glitter on top. I did let the glue dry overnight before I tapped the excess glitter off, I wanted to make sure the glossy accents didn't run when I tipped the sticker. I made another card with this glitter. I used it to accent the sticker as well as covering a piece of wood veneer. I love how the glitter dressed up the cake stand and made it stand out. I'm so happy with how it turned out. Your projects are unbelievably darling Becki! I'm so happy you got to play with us this month! Thank you so much. I love all of the sparkle. I think the cake stand is my favorite. OOH! I love the cards! What a gorgeous layout! I love your use of the glitter. Thank you for sharing your talents! These are great! I especially love that layout, it's bold, but not too much, and what a great photo! Great job! I especially love the lay-out. What a special project. The cards are great too! These are cute. I like how the colors stand out. Cute cards. I love the extra sparkle the glitter gives. There are some great ideas that are quite simple to do. Thanks! Beautiful layout! And gorgeous cards! And I love your handwriting, too! 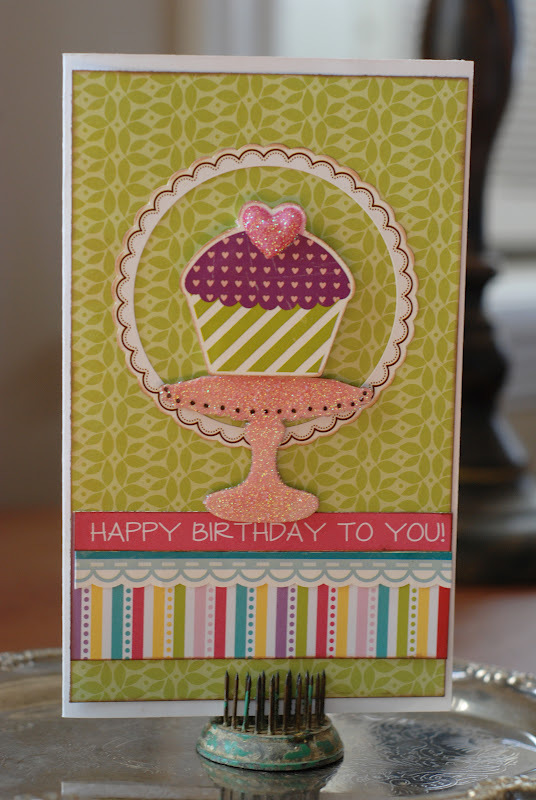 Your layout and cards a just sooo sweet! Beautiful job using the glitter! Aha moment for me. Don't disregard seemly ho-hum stickers. They become center stage with a bit of glitter! Thanks for the inspiration!! the circles on your layout turned out so cute!! and love the cards. you did a really great job with all these projects and showing how to use glitter. I haven't done it before myself. Glitter gum balls!! so cute. Love the glittered circles and doilies on the LO!! All the cards are beautiful and I love how the glitter really finishes them nicely. The cupcake was my favourite! The glitter gave everything such a finished look. Gorgeous. Love your projects! Love the polished look glitter gives. I love your projects! Thanks for the inspiration! These are super sweet cards. Love the little touches of glitter that make the elements pop. Love the mix of glitter and doilies! And the cards are so cute. Great job with the glitter! All your projects are great, but that layout of your daughter is stunning. Gorgeous page and cards! I think these were my favorite of the blog hop. They make me want to play with glitter! Love the way you used the glitter on your projects! The little bits of glitter on your cards is perfect! 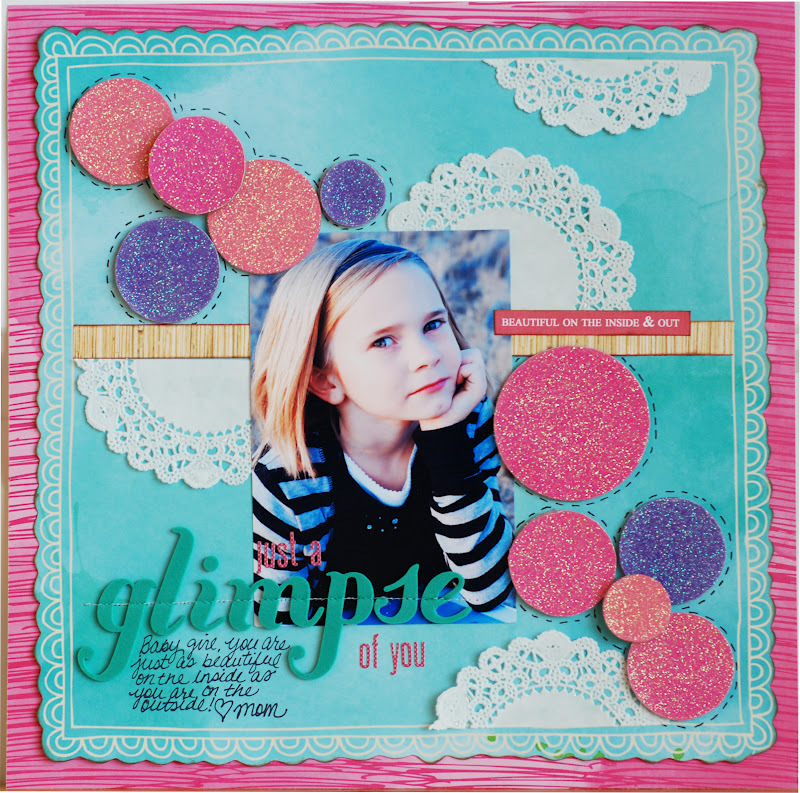 And I love the glittered chipboard circles on your layout! Oh my! I just adore all these cards, they are soooo Fab! Love your comment regarding getting the packages off the porch, I can totally relate!!! Love your cards. All the sparkle is perfect. The cards are super sweet and I love the layout!!!! Such a smart thing to do with chipboard!!! Your LO is amazing, those sparkly circles add so much to the page but don't take away from your beautiful daughter! And your cards are perfect with the minor touches of glitter! The sparkles on your cards and layout - really work! I'm going to grab my sparkly gear and get going! I love the simple addition of sparkles to your cards! Thanks! Oh my word! Your projects using the glitter are amazing! TFS! So adorable! Love all your projects!! Lots of great projects! I especially think your LO is wonderful! The glitter added such a colorful touch! TFS! The sweet treat cards are darling -- cant decide which one I like best! Thank you! I just loved your layout! Your layout is just gorgeous. I love how the sparkle is so feminine, and mixes beautifully with the doilies. Beautiful! love the circles in the layout! Oh wow!! Great use of glitter. I had to pin that scrapbook page on Pinterest. I just love it! Very pretty layout, the glitter adds alot of bling, but does not over shadow the photo or other elements. Adorable cards! Wow, I love your projects. 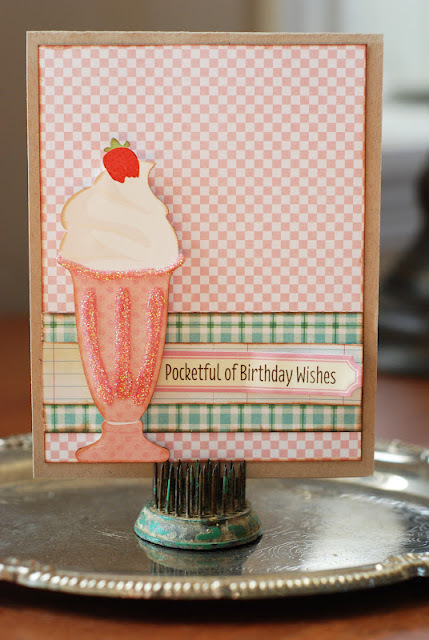 That layout is stunning, and then the cards well it all just kinda "knocked my socks off"! lol. Glitter and Glossy Accents are a winning combo for sure! Love all your projects. Awesome projects...especially love the card set! Love the layout- what a pretty daughter you have! Oh my gosh, love your projects,the layout and cards rock! i am in love with your cards!!! gorgeous! Love your layout and your cards are simply amazing. Love them all!!! Thanks for the chance to win. Wonderful projects. Thanks for sharing them and the chance to win. love your projects - you really went all out! i love how you dressed up the cards. great way to embellish a die cut or sticker!